There is a product you will find in my purse from October through April: OPI Avojuice Skin Quenchers. My favorite variety of the moment is the Crisp Apple Juicie. I am keeping my hands and nails hydrated throughout the day while enjoying the perfect scent of Autumn. 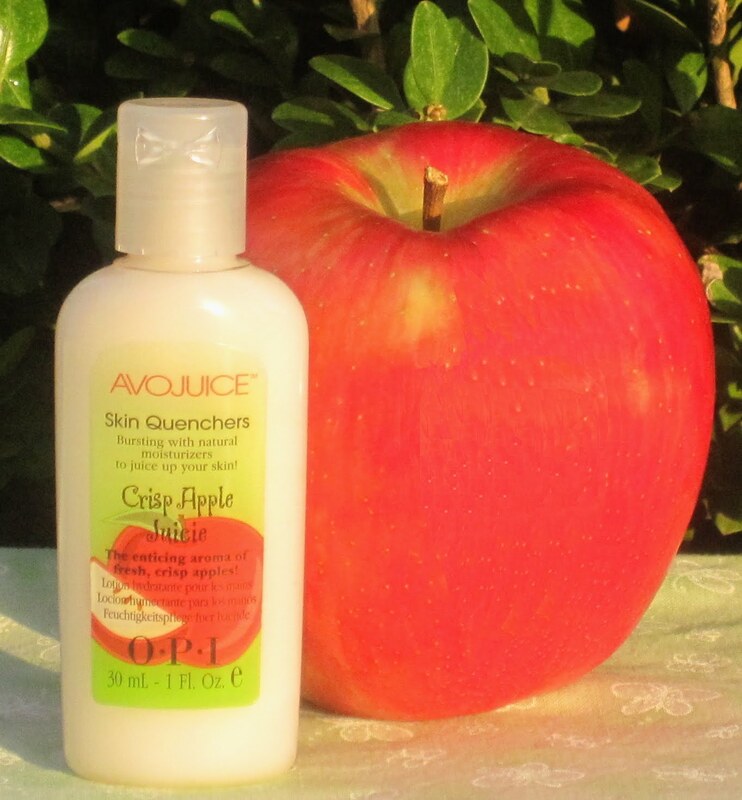 OPI Avojuice Skin Quenchers: Crisp Apple Juicie, 1 fl. oz. (30mL). I have been using OPI Avojuice during the cooler months for the past two years. I apply it typically once a day. During the coldest temperatures of the season, I often reach for it twice daily. If the skin on your hands feels dry, your nails and cuticles are likely in need of moisture. Applying OPI Avojuice can help prevent damage to nails exacerbated by dryness. Nails that are kept moisturized will retain flexibility, a key component in maintaining length. It will also help prevent peeling, splitting and breakage. Avojuice Skin Quenchers are currently available in the following fragrances: coconut melon, cran & berry, crisp apple, ginger lily, grapefruit, jasmine, mango, peach and raspberry violet. You also may encounter seasonal scents like berry merry rose, caramel cream, mocha mint, pumpkin butter and winter huckleberry. The fragrances are strong, but pleasant. I would recommend having a few varieties on hand to coordinate with your favorite perfumes. If you are concerned about purchasing the 1 oz. (30mL) trial size for environmental reasons, Avojuice is also sold in 6.6 oz. (200 mL) and 20 oz. (592 mL) bottles. The liquid consistency makes it convenient to either refill your 1 oz. bottles or transfer a small amount into your own travel container. Even with regular use, I don't tend to go through much product. The ingredients for the Crisp Apple Juicie include: Aqua, Propylene Glycol, Dimethicone, Behentrimonium Methosulfate, Cetearyl Alchohol, Parfum/Fragrance, Polyquaternium-37, Propylene Glycol Dicaprylate/Dicaprate, PPG-1 Trideceth-6, Allantoin, Tocopheryl Acetate, Aloe Barbadendsis Leaf Acetate, Persea Gratissima (Avocado) Oil, Pyrus Malus (Apple) Fruit Extract, Ethylhexyl Palmitate, Lecithin, Caprylic/Capric Triglyceride, Benzophenone-4, Isopropylparaben, Isobutylparaben, Butylparaben, Methylparaben, Alcohol, Glyceryl Stearate, Oleic Acid, Ascorbyl Palmitate, Tocopherol, Eugenol, Hexyl Cinnamal, Butylphenyl Methylpropional, Hydroxyisohexyl 3-Cyclohexene, Carboxaldehyde, and CI 15985 (Yellow 6). The formula does contain some wonderful natural moisturizing ingredients including aloe vera, avocado oil and vitamin E. It's evident by the beautiful fragrance that apple extract is included. Even though I tend to prefer a less complicated ingredients list, I appreciate how Avojuice absorbs instantly. It's a quality I require in a daytime hand and nail moisturizer. If you are planning stocking stuffers for the holidays, OPI Juicies are the perfect fit. The 1 oz. size is great for sharing in gift bags too. I rely on OPI Avojuice Skin Quenchers as part of my daily hand and nail care routine. I definitely recommend this product. OPI Avojuice is sold at transdesign.com. I have also seen Avojuice at Ulta retail locations. I purchased mine locally at Beans Beauty.